Sattva MedTech was co-founded by Vibhav Joshi and Sumedh Kaulgud in 2014. The startup is now ready to roll out its first product in the market– a low cost ECG based device for monitoring fetal heart rate.In an interview with IndiaBioscience, Sumedh Kaulgud, Chief Technology Officer at Sattva, speaks about the drawbacks in existing technologies for monitoring fetal heart rate and how their product addresses these gaps. What is Sattva MedTech about and why did you start this company? We are a 3-year-old company, currently building our first product, Fetal Lite – an ECG based fetal heart rate monitor. The current standard for monitoring heart rate is ultrasound-based, which is not advanced or effective for a variety of conditions. We are trying to move the technology from being reliant on Doppler effect to ECG, which is a lot more accurate and reliable. Our device captures signals, both from the foetus and uterine contractions from the mother in a non-invasive manner. My co-founder and I are from BITS Pilani, Goa and have family members in the medical field. The inclination to start a company in the med-tech sector was always there, but the idea got cemented at the end of an entrepreneurship course at our college. Initially, we were ideating and applying for a few grants at different incubation centres. We moved to Bangalore as soon as we were awarded our first seed grant from BITS 75 Charitable Trust. What competitive advantage does your product have over others in the market? The ultrasound technology suffers from a major drawback of manually optimising the position of the probe to be able to record heart rate. If the user is not accurate in positioning the probe, it is difficult to obtain an appropriate signal. Since our technology is based on ECG which travels throughout the abdomen, no matter where the probe is, the signal always gets captured. In addition, the probe has multiple sensors instead of a single one. This circumvents any issues of probe orientation and signal acquisition such that the signal to noise ratio is much higher. Third, our device tackles one of the major issues in the med-tech sector, which is, lack of skill. Most nurses are not experienced or trained well enough to ensure the reliability of tests and accurate reading of results of heart rate monitoring. By removing the skill aspects, we reduce the time required for diagnosis and ensure better health outcomes for the mother and the baby. Lastly, there are no low-cost ECG based monitors in the Indian market. There are two global competitors outside India that use similar technology, but these were developed in the US and UK and designed mainly from the perspective of a western user. So they haven’t addressed the skill dependency in Indian segment. Their cost also runs up to 3-4 times that of a local device (Sattva’s device). To sum up, our whole focus is that our device should be skill independent, easy to use while being as reliable as possible. What are the requirements that need to be addressed to enable a faster transition of a startup from an incubatee to a successful company? We have just started commercialising our device. Based on our experiences, I think one of the main drawback of the Indian system is lack of availability of ready statistics. We don’t do a lot of data collection in our country, whether free or paid, in the public or private sector. For example, a simple figure, like the number of ECG machines, or the number of NST-CTG (Fetal Non-Stress Test-Cardiotocography) machines sold in India is not known. This kind of information is not only needed for someone who plans to market their device but is also important for the overall healthcare sector of the country. People in developed countries don’t face these problems, so it is much easier for them to analyse the market and build devices. I don’t know if this gap can be filled by a private entity or should the government step in. Based on the trends we are seeing in medtech, going forward, big data is going to play a very big role - in terms of patient trends, patterns and preventive healthcare. Was attracting interest from doctors and investors difficult? We were lucky that we got a medtech focused investor early on in our company life. During the first six months, we got invited to incubate in one of India’s leading medical accelerator called InnAccel. It was here that we got our first push to learn how to interact with doctors. Once we crossed that barrier, it was just a matter of perseverance. We also acquired a grant from the Millennium Alliance (MA), which is a partnership between USAID and Govt. of India. How did the bottlenecks you faced helped shape product development at Sattva? In terms of technology, one of the biggest learning curve we faced was that the speed of iterations in building hardware is much slower than software development, where you can do debugging quickly. For us, after (seeing) every single patient, we had to sit back and do a thorough analysis of what went wrong and solve as much of it is as possible. We tried to ensure that we got the product development right in the very first iteration. One of the other challenges was access to patients. In general, getting access to patients in India is not that difficult when compared to the western world. However, due to the sensitivity associated with pregnancy, mothers would get hesitant to give permission to test the initial prototype of our device. This led to the realisation that our product was built from the point of view of an engineer. We needed to keep the patient’s perspective in mind and build it in a way that it looked safe, and the patient is comfortable using it. This led us to hire a product designer early on, even before we had fully established the technology. What kind of product iterations occurred during this phase? 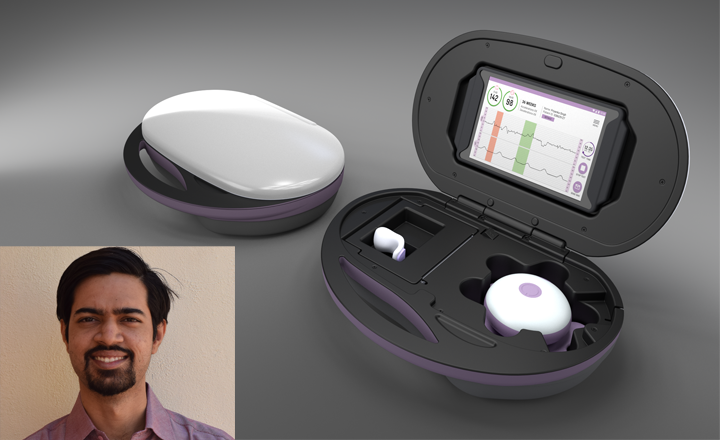 Our initial concept was a home care device, where an expecting mother could use it at home herself. During the course of interactions with doctors and (med-tech device) distributors, we realised that an at-home device may not be feasible idea especially in the event of a complication. The safer approach for the patient would be to reach a clinic or a hospital. We took that shift in our strategy about a year and a half back. Instead of making it compatible with different types of smart devices, as was our approach initially, we decided to bundle a dedicated tablet with our product. This would also allow more computational power needed for data analysis. The data can be captured wirelessly and shared with other doctors on the fly as well. We are excited about formally launching our device by the end of this year as we received the CE (Conformité Européene) certification for our device just last month.Now that we have set up an end to end development process and a capable team we want to accelerate our growth. We are interested in creating a whole portfolio of devices for the unmet clinical needs of India. In this regard, we are looking to expand our team and test new ideas. Our goal is to have at least two ideas in the pipeline by the end of the next year, at a prototype or clinical validation stage and one more that is at ideation stage.